Canon Vixia HF R600 has been very popular on the market, especially among people who need a truly decent and reliable camcorder, either for vlogging, semi-professional footage, or personal/family use. It offers excellent performance and output quality, yet is available at an affordable price point. However, not so long ago, the company has released a newer, updated model, which is named Canon Vixia HF R700. R600 and R700 look extremely similar to each other. So, is there actually any difference between the two models? Which is the one that you should choose? Both Canon Vixia HF R600 and Canon Vixia HF R700 still rely on the 3.28 MP 1/4.85” CMOS image sensor, which performs an exceptional job in capturing subtle details and reproducing accurate colors and dynamic range. The power is furtherly enhanced by the DIGIC DV IV image processor. Both Canon Vixia HF R600 and Canon Vixia HF R700 have incorporated the latest and most advanced Canon HD image processor, allowing them to capture more light for brighter, noise-free images even in dark and low-light scenes. They both record in a maximum quality of 35 Mbps, which is sufficient to deliver outstanding output qualities. Both models also offer up to 57X Advanced Optical Zoom. Canon Vixia HF R600 and Canon Vixia HF R700 are extremely versatile, with a telephoto power that spans from 32.5 mm all the way to 1,853 mm (35 mm equivalent). Such impressive capability becomes very handy whenever you need to record footage from long range, such as for shooting a football match or race. In addition, both models offer continually variable Zoom Speed settings with 15 available settings. They also feature the SuperRange Optical Image Stabilizer, which corrects any camera shake instantly. Even handheld videos that are taken at long focal lengths can stay sharp and steady. By controlling the vertical, horizontal, and roll axis shakes, the system ensures smooth and distortion-free recording, no matter if you are walking while shooting. Canon Vixia HF R600 and Canon Vixia HF R700 also retain identical features, including the Framing Assistance, Intelligent IS, Scene Selection, and Baby Mode. However, it is said that R700’s Baby Mode has been improved with a more intuitive layout. 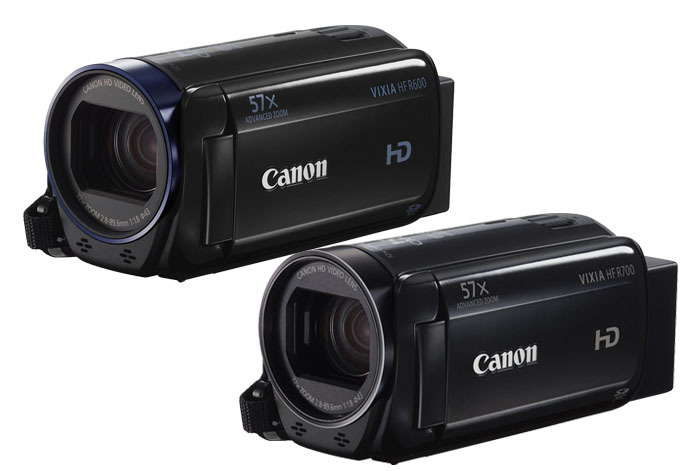 There is no significant difference between Canon Vixia HF R600 and Canon Vixia HF R700. You may choose the R700, since it is newer, but R600 is also a great choice should the model is available at a lower price.